"Do not be seen by humans. That's been the law of children of the underfloor." 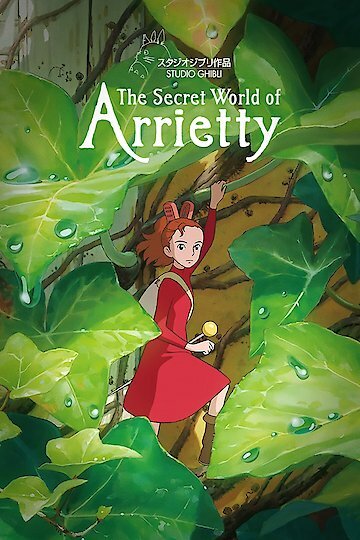 "The Secret World of Arrietty" is a Japanese film produced and released by Studio Ghibli, available for viewing in in both the English and Japanese language. Originally titled "Kari-gurashi no Arietti," the film was directed by Hiromasa Yonebayashi and lists Hayao Miyazaki as a screenplay writer as well. The film is based on one of English author Mary Norton's children's novels, which is titled "The Borrowers." The original story tells the tale of a family of tiny people; due to their size, the only way for the tiny people to survive in a world that's so much bigger than them is to borrow small amounts of supplies from humans. The film opens by showing Shawn, a young, normal sized human boy, moving to a country house in Japan to rest due to health reasons. Almost immediately after arriving, Shawn spots the film's protagonist: Arrietty. Arrietty is one of the Clocks, a family of four-inch tall people who live within the walls of the country house. The tiny people call themselves "Borrowers," and just like in Norton's book, the family must sneak into human houses to find anything they need, from crumbs of sugar to tissue paper. After Shawn's arrival, Arrietty's father decides that she should go with him into the human household as he looks for supplies the family can borrow. Arrietty sees the interior of the house for the first time, observing how her father scales massive "cliffs" and "ravines" (that are in fact the walls, counters, and spaces between items in the human household's kitchen). Unfortunately, as the night ends, Arrietty and her father are spotted (again) by Shawn, who awakes in the middle of the night and sees the pair lifting a tissue from the box lying next to his bed. The rest of the movie focuses on Arrietty as she struggles to control her curiosity about Shawn, while her family decides whether or not it's safe for them to remain in their home.